a nomination at the Black Entertainment Television (BET) Awards, and a hugely successful album ‘Da Revolution 2′, it’s only fair they thank their fans for the support. 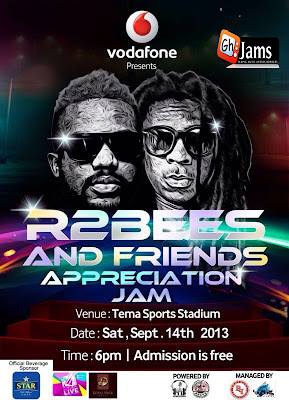 On Saturday September 14, 2013, they will stage a concert at the Tema Sports Stadium themed “R2Bees and Friends Appreciation Jam”. R2Bess will be supported by some of the biggest acts in the country. The concert starts at 6pm and it’s absolutely free. R2Bees and Friends Appreciation Jam is powered by R2bees Entertainment and sponsored by Vodafone.